Project Description: When aquatic species invade and establish (especially those that provide or modify habitat) native species can undergo temporal changes in taxonomic and functional compositions related to the invasive species’ density patterns (i.e., succession). 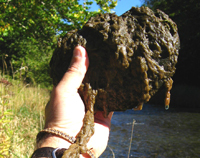 Here, we will examine a freshwater system (upstream and downstream tributaries of the Prettyboy Reservoir in Baltimore County, MD) that is currently invaded by two functionally different aquatic invaders: the diatom Didymosphenia geminata (Dg) and the New Zealand mud snail Potamopyrgus antipodarum (Pa). First, we will survey streams to document Pa and native snail distribution and parasite loads to determine if parasite prevalence may be influencing snail abundance patterns. Second, we will perform a field succession and facilitation experiment to examine spatiotemporal changes in the turnover of macroinvertebrate communities over one year (in the case of succession) and two months (for facilitation) as a function of seasonality and invasive species taxon and density. Densities of both species, in general, decline downstream from the reservoir, creating a natural density gradient. Instead of sampling populations using kick nets, which only give information about the current state of the community, here we track temporal trends as communities change over time. Integrated into our experimental design is the inclusion of citizen scientists, who will participate in field and laboratory aspects of this study. The proposed work integrates the interdisciplinary fields of community ecology, parasitology, and field ecology to create and support new knowledge assessing the health, function, and threats to freshwater ecosystems and communities by invasive species. Previous studies on Pa and Dg have provided snapshots on a local and reduced temporal scale. Our study will be among the first to link patterns in community-level processes mediated by invasive species through time and space to understand community ecology.